(This is in reference to yellow Turkish diaspore): Diaspore opens the Solar Plexus, and through it fills the entire body with gold light, enlivening and strengthening our life force, right down to the cellular level. It also opens the Third Eye and Crown Chakras, encouraging development on a spiritual and psychic level, while helping us remain grounded, protected and strong. It is especially protective for the Throat Chakra, but also allows a release of the past from the same area, helping us to communicate more freely without the hindrances of previous negative experiences. The energy is very directional; when held horizontally, it allows for expansion, but when held vertically it aligns and centres energy. With great care and prior experience, it can be used in trance mediumship to invite our Guides in to speak through us. 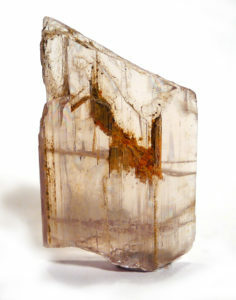 Diaspore is an aluminium ore. It forms in metamorphic rocks, such as schists and marbles, and is often associated with corundum (ruby and sapphire) and spinel. 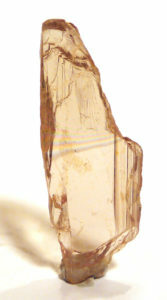 Crystals can be thin and platy, elongated, tabular, prismatic, or acicular, and it is also massive or forms as disseminated grains. It has a colour range including white, colourless or grey, yellow, and lilac to pink, and is strongly pleochroic, so crystals can be three different colours when observed from different directions. Gem grade yellow crystals are found in Turkey (where it is known as zultanite), which are faceted or cut en cabochon for use in jewellery. Named in 1801 by Abbé Rene Just Haüy from the Greek διασπείρειυ diaspora, meaning “to scatter”, in allusion to its decrepitation (crackling) when heated. There are no traditions associated with diaspore.